Nonfiction for young adults always seems like a mixed bag to me -- walk into any young adult section in a bookstore and the nonfiction is often squeezed together on a few shelves while fiction sprawls along for veritable miles. I know there are plenty of series out there of biographies and history and nature, but when it comes to sinking their teeth into the kind of gripping nonfiction narrative that say Erik Larson or Sebastian Junger is known for, well, that sort of title you have to literally trip over to find. I am constantly on the lookout for decent nonfiction for YAs, whether it is primarily directed toward an adult or teen audience. Here’s what I’ve lucked into over the past few months. Josh Bernstein is the host of the History Channel’s top rated program, Digging for the Truth and his new book by the same name includes chapter length highlights of shows from the first two seasons. It could have been just standard coffee table fare largely targeted only at fans of the show, but from the very beginning Bernstein writes a narrative; he tells a story that is far beyond that of the average host’s duties. What will particularly make Digging for the Truth a winner for young adults is that it begins with Bernstein’s childhood and explains how he came to host the program. It’s the sort of information, about favorite classes, summer camps and valuable time spent soul searching, that points the way for those interested in enjoying a similar lifestyle. Bernstein’s infectious desire to learn and do more is exactly the sort of thing that will drag any kid with the slightest bit of interest to get off the couch and do something outside. Couple this book with Peter Beard’s Zara’s Tales and you just might start an outdoor revolution, one bored teenager at a time. Following the first chapter focused on his personal life and how he came to host the program, Digging continues with chapters on episodes that have taken Bernstein all over the world. The program is not merely a travelogue, however, it is after all broadcast on The History Channel and the point is to investigate and educate in the most exciting way possible. On a rather dangerous trip to the mountains of Italy, Bernstein learns about “the iceman” a man who lived and died during the Neolithic period over 5,000 years ago but was remarkably preserved in the cold climate and discovered in 1991. One of the more amazing moments for Bernstein while filming this episode was the realization that the discovery of a copper ax with this body had transformed history. That one ax proved that the Copper Age actually began 500 years earlier than historians previously thought. “Shows you how much we know….” writes Bernstein, and the reader can not help but start wondering about a thousand other assumptions that we might be one random discovery away from proving wrong. From Italy, Bernstein goes on to Easter Island, where he finds himself breathing air purer than any he has ever known and thus wondering about the environmental state of the planet. In Ethiopia, on the trail of the Queen of Sheba, he finds churches that have been carved into the land. “It’s said that Michelangelo could look at a block of marble and see the figure of David or the Pieta hiding inside it,” he writes. “The people who conceived and carved Lalibela obviously did the same thing, just on much much larger scale.” Few western readers will have any concept of an Ethiopia that includes such beauty and craftsmanship, but Bernstein finds it, and he is as thrilled to see it and write about as readers will be to see the pictures and learn. Digging for the Truth is a heavily illustrated, exciting, funny and smartly written book about all sorts of human history. It’s fascinating to read and beautiful to look at. Shockingly, as I’m such a history junkie, I had never heard of the program before receiving this book. Now, I am a guaranteed regular viewer and look forward to seeing just what Josh Bernstein has to share with us next. For this war to end, everyone will have to give up a little. No one will win completely. It will have to end some day, but both sides will have to give up something. The world isn’t perfect. We should have learned more from the Holocaust -- the world, I mean. We didn’t learn enough, or the world would be better than it is. If one thing is obvious from this collection, it is that as long as they are separate, no one will be safe. Reading the thoughts of the children from the region makes this apparent, far more than the latest headlines or body counts. There is no political posturing in Three Wishes, only the words of children. The fact that so many of them are not what we want to hear only makes them that much more important and truly a must read for young adults everywhere. In a very impressive entry into the Groundwood Guides series, author Haroon Siddiqui, a Canadian newspaper editor and a past president of PEN Canada, tackles the vast subject of Islam in his book, Being Muslim. The Groundwood Guides “provide an overview of key contemporary political and social issues,” and Siddiqui’s book certainly qualifies on that score. Small in size (only 160 pages with notes), it seeks to demythologize a religion that both captivates and repels the western press. Being Muslim, we think, means you believe in bloody jihad, that women should be covered in veils and are anti-democracy. Being Muslim means you are nothing like Americans, Canadians or most Europeans. We know this for sure even though we have no basis for our convictions. Aware of this lack of study, Siddiqui doesn’t cut his readers any slack; he goes right to the bone on every issue. “The fact is,” he writes, “they [Muslims] hate the United States not for what it stands for, but for what it has done.” Before readers dismiss this with something akin to “Abu Ghraib exhaustion” consider what Siddiqui gives us to consider. It is not just the prison scandal in Iraq that angers Muslims, but also “American support for Israel’s occupation of Palestinian lands,” alliances between the U.S. and “undemocratic and oppressive Muslim -- particularly Arab -- regimes,” the American-led economic sanctions against Iraq that “caused the slow deaths of an estimated 1 million Iraqis, half of the children under the age of five” (numbers from UNICEF), and Washington’s silence over the Russia war against Chechnya which have resulted in between 100,000 and 200,000 Muslim deaths (these stats from Time magazine). Clearly, Siddiqui has done his research and we haven’t even gotten to torture of prisoners in American captivity, the existence of the Guantanamo prison or that lovely CIA policy of subcontracting torture by sending political prisoners to countries that will do the dirty work for us. There are a lot of things that have been done and action which has been taken or withheld, that most Americans do not even think about but resonate strongly among Muslims around the world. Whether or not we agree with them on each point is not so much the issue. We need to think about what we are doing and see our actions from more than just our point of view. That is the message Siddiqui hammers home and as it is simply a variation of the same thing we have been told since we were children, it is hard to argue with. But that’s not the only point this book is seeking to make, or the only one that matters here. If you are Muslim, it is easy to see how a lot of things said and done in the past would be cause for healthy distrust and outright anger against westerners in general and the U.S. in particular. The only way to have positive discourse on the many issues between the U.S. and the people of Iraq, Iran, Syria, Afghanistan, Saudi Arabia, etc. is if we have some clue as to what they are thinking. The old method of insisting that it is “us against them” does not work. Instead, as Siddiqui so effectively and easily shows, it has fueled the fires of discontent among millions of Muslims worldwide. Quite frankly, if we don’t take the time to consider that there is another side to the conflicts we find ourselves embroiled in, then we are doomed to repeat costly mistakes over and over. Being Muslim is a very easy and comfortable read. Whether you seek to understand the religion at its most basic levels or have questions about the nature of jihads, why the hijab is worn or what sharia law is, Haroon Siddiqui is here to help. It is written for teen audiences but I can’t recommend it enough for adults as well. Starbucks recently chose Ishmael Beah’s A Long Way Gone to sell in all of their stores following up Mitch Albom’s latest book which sold close to 100,000 copies with the coffee shop chain’s exposure. Beah’s book could not be more different from Albom’s and has to be one of the more intense and brutally honest stories of war that I have ever read. It’s a perfect way for young adults to learn about the plight of child soldiers and their struggle to find a way to live in societies that are torn apart. Reading this book is going to make them think, guaranteed. Initially, Beah was an average kid living in a small village and attending school with his older brother, Junior. His parents had split up but he remained in contact with both of them and was particularly close to his mother and little brother. When the book begins, he recounts how he and Junior had become fascinated by American rap music and formed a small group with friends to sing and dance to famous songs. It was because of the group that they were not present in their village when rebel forces attacked and destroyed it, killing many civilians. Beah, Junior and their friends were in a nearby town, planning to attend a talent show. This attack was their first direct experience with the war that had been simmering in their country for years. It was also the attack that took Beah away from his parents and little brother and sent him on a journey wandering across Sierra Leone in a fruitless search for peace. In the years that followed Beah became a soldier for the government and in graphically written scenes he describes the firefights he took part in, the friends he saw die and the men and boys that he personally killed. He was high on marijuana and cocaine for most of this period (as administered by the military officers) and spent his time watching American war movies or shooting people. All he did was kill, talk about killing and train to kill. That was his life and it was the only life he expected to have. The reason he is not dead today, as so many of the children he knew are, including his older brother, is because UNICEF intervened in the conflict and set up rehabilitation centers for boys under the age of fifteen. The chapters on that rehabilitation are some of the most harrowing and interesting in the book as they show just how hard it is to deprogram children trained to kill. In his case it did work and Beah came through the other side, eventually becoming a spokesman for his people and the UNICEF rehabilitation process. When the book ends, he is fleeing the capitol city of Freetown for the nearby country of Guinea where he plans to contact a friend in America (whom he met while speaking before the UN with other children from war torn countries) who has offered to help him get to the States. Readers know Beah made it, but how he did and what happened next is mentioned only briefly. Hopefully he is planning a second book to go into that part of his story. There is so much about A Long Way Gone that will surprise most western teens. Beah was just a typical kid; a student, a fan of American culture and a well educated and articulate young man when he became enveloped in war. It’s easy to think “those people have always been fighting” and dismiss daily television reports of violence on the other side of the world, but Beah makes it clear that in every way imaginable he was just like American teenage boys. It is that similarity that makes what happened to him so frightening. When he writes, “My squad was my family, my gun was my provider and protector and my rule was to kill or be killed,” readers know at this point that once he was not like that; once he was just a boy memorizing lyrics to the latest LL Cool J cassette. Once he was like them until his world was gone and he was taught to be like something else; a monster. And so he was, in a very short time he was. Switching gears a bit, as any fan of the sport knows, there is a serious dearth of books on ice hockey in the U.S. For those of us who grew up as the children of die-hard fans, this is particularly noticeable; before the Internet it was nearly impossible to even buy my father a Montreal Canadians t-shirt. (It’s not like the stores in Florida were falling over themselves to sell hockey merchandise back in the eighties.) All of this whining is just to explain why I was so thrilled to receive a copy of Ice Time: The Story of Hockey by Michael McKinley. This young adult coffee table-sized title is full of all sorts of brief stories about teams, players and game politics that will be viewed as sheer delight by fans. For me, it was twenty years overdue, but still soundly welcomed. Published by Tundra Books, McKinley’s book certainly has a Canadian perspective, but when it comes to hockey that is only appropriate. He gives a concise history of the game’s origins in the opening pages and then delves into certain aspects of its professional play that may come as a surprise to readers. “This was still the era of the amateur,” he writes about the early 20th century, “when team owners could make money, but players could not. Players were supposed to play for the love of the game.” This attitude was absurdly hard on players, just as it was on baseball players in the U.S. (Remember why the Chicago White Sox were called the Black Sox?) Many of them rebelled, most notably Fred “Cyclone” Taylor who sat out a season and then went on to eventually earn more money than the Prime Minister of Canada! In response to the shut-out, Frederickson and his other immigrant teammates helped form a new league and went on to beat the established teams who had refused to acknowledge them. In 1920 they even represented Canada in the Olympics where they outscored their opponents 29-1. Five years later the IOC determined that 1924 would be the official start to the winter games and so the 1920 medal is not listed in Olympic statistics. But Frederickson knew they won and so did Canada, and because of McKinley’s diligent research, 21st century readers will learn about it now as well. From the first female teams to the success of famous players like Maurice Richard and Bobby Orr, McKinley has done an excellent job of mining hockey’s history for enough well known names and little known stories to make Ice Hockey a page turner. It’s clearly an excellent resource for reports and research papers but for me it was just a great way to spend a few hours one afternoon. This is a richly illustrated, delightfully written history of one of organized sport’s truly great games. Long overdue but well worth the wait, Mr. McKinley has much gratitude for his efforts from this lifelong hockey fan. 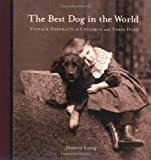 Finally with The Best Dog in the World, Donna Long has produced a very interesting and unique collection of vintage photography that both dog fans and history buffs will enjoy. The pictures all date between 1875 and 1925 and show children posing with their dogs. When captions were present on the photos, she reproduces them here, so we learn of “Clarence, Irene, Wilma and Nero, Taken May 1907” or “Frances and her dog Fritz.” Through the help of experts Long was able to give approximate dates for all of the photos, and when the breed of the dog is obvious she provides fascinating information on the its history, often quoting from period titles such as The Book of Dogs, published in 1919. There is quite a bit of fascinating social history contained in this elegant book, and combined with the large pictures on each page it is really a beautifully designed title. I was most fascinated by some of the more unexpected things such as this quote from The Sporting Pit Bull Terrier published in 1910: “These dogs make remarkably faithful and reliable companions and watch dogs, they are exceedingly handsome to look at, of affectionate disposition, easily taught many useful and pleasing stunts and delight in the extermination of all sorts of objectionable vermin.” That excerpt accompanies two separate photos of children with their pit bulls, one of whom is easily less than a year old. It is hard to imagine a similar picture being taken today of a baby with her hand so casually placed on a breed we consider to be vicious and even deadly. In that regard, The Best Dog reminds readers that many breeds have been sorely damaged by their human treatment in the 20th century, and are definitely not beyond redemption. The Best Dog in the World is one of those quirky titles that while a pleasure to look through might not be an immediate choice for young adult readers. I can see how easily it would appeal to dog lovers however, especially younger ones who will pour over the old photographs of children and their beloved pets and seek similarities between themselves and the kids in the pictures. There is also far more information on dogs then you would expect in such a short book that is so obviously geared first towards an artistic presentation. Consider this one a pure and simple delight that really shouldn’t be passed up. If you’re looking for more from the world of books in the next few weeks, be sure to check out my regular site, chasingray.com. I’ll be back here in April with titles all about teenage guys – and just how hard it is to navigate that whole “becoming a man” thing. Cool Read: In Wild Fibonacci author Joy Hulme (with the gorgeously detailed full page illustrations of Carol Schwarts), seeks to demystify the Fibonacci code sequence in nature. Through a couple of brief introductory pages she explains the history behind the code (first discovered in 1202!) and how it is “evident in lifesaving features of many animals”. The mathematical pattern that Fibonacci discovered plots a curve called an “equiangular spiral” -- that’s where the animals come in. This spiral is found in the design of tusks, teeth, horns and beaks and Hulme uses poems to point out the specific feature in each animal depicted in her short book. She also uses the number of animals to show how the Fibonacci sequence works, where “the next number in the sequence comes from adding the two numbers before it.” Following this pattern, she writes that “Three reptiles have fierce curving teeth” on one page (1+2=3), and “Five birds of prey, like bullets, drop down with deadly aim/Their curving talons grab a meal and carry off the game” on the next (2+3=5).